Do you play badminton once or twice a week, each time for more than one hour? Actually, not just badminton players, anyone who exercises regularly will benefit from the suggestions in this article, so be sure to read it carefully! When talking about the relationship between sport and diet, it is important to know the speed that different foods are digested by the body. Saccharide foods such as white rice and toast, will raise blood sugar level immediadely after they are consumed. In terms of speed of digestion, these are followed by protein, used to form muscle; fat needs the assistance of more digestive enzymes to be digested and usually takes a relatively long time to be digested by the digestive tract. This is why experts emphasize the importance of eating the right kinds of foods before sport and suggest that ordinary people (especially those with low blood sugar levels) can eat a small amount of a saccharide food before sport to give them they energy they need and stop them suffering a reduction in muscle power and lack of energy during sport. Readers are specially reminded to avoid eating foods that easily create gas such as beans, dried bean curd, or broccoli, or high fiber vegetables that are digested slowly, such as celery, mushrooms and bamboo shoots, before sport to avoid stomach discomfort during sport. Everyone’s has their own motivation for doing sport. If you want to keep in shape or stay healthy, we suggest that your calorie intake is close to your calorie need to produce the best results. How should our ideal body weight be calculated? Nutritionist Cheng Pei-rong says that 10% counts as standard. Outside this range bodyweight is too light or too heavy. Researchers have pointed out that people who are within the normal range often live longer than those who aren’t, showing it is not good for us for bodyweight to be too light or too heavy. Depending on whether you do low, medium or high intensity work, multiply the suggested calorie need by your body weight to find how many calories you should consume a day. Low intensity work: Work that is mostly stationary or sitting down, such as housewives, office workers, bank tellers, cashier, and drivers. Medium intensity work: Work like machinery operation, reception or housework that involves a lot of standing, such as nannies, nurses and waitresses. High intensity work: farm, fishing, industrial or building work that involves a lot of physical labor, such as sportsmen and removal men. After calculating your daily calorie requirement, divide it by three; this is the number of calories each meal should have. 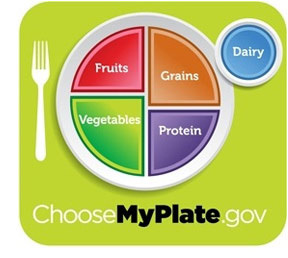 For allocation of nutrients, you can refer to the US’s latest daily diet guide My Plate which divides a plate into four parts: one vegetables, one fruit, one whole grains and the other protein foods such as beans, fish, meat and eggs, accompanied by a portion of diary products to supplement the body’s calcium and alleviate the problem of many people lacking calcium in their diet these days.